Fiat Professional gathered together some of the finest fullbacks that the British Isles has ever produced to answer the age-old question – which sport is better: football or rugby? Danny Mills (England) and Jackie McNamara (Scotland) made up Team Football, while ex-Lions fullbacks Geordan Murphy (Ireland) and Lee Byrne (Wales) represented Team Rugby. The two teams faced each other in a series of unique challenges incorporating the new Fiat Fullback. 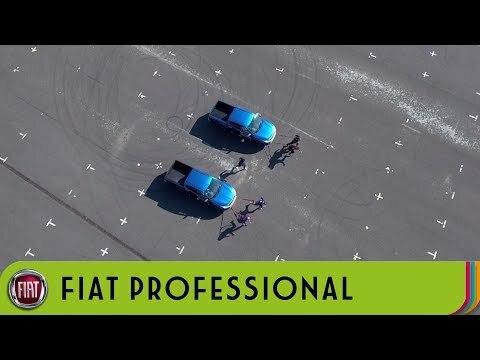 Challenge one involved the two teams pulling the new Fiat Fullback, World’s Strongest Man-style, as far as they could in 15 seconds in a best of three format. Team Football took Team Rugby by surprise in round one, storming to a convincing win, despite an obvious size disadvantage. However, Team Rugby reasserted themselves, narrowly winning rounds two and three to emerge victorious from the first challenge. Challenge two tested accuracy, and required the teams to strike footballs through the back doors of a moving Fiat Professional Talento van, with two rounds of ten strikes. Despite their obvious advantage, Team Football struggled, losing round one 3-2 to Team Rugby. They levelled the scores in round two winning 2-1 to send it to a ‘sudden death’ round. Danny Mills eventually hit the winning shot for Team Football, bouncing the ball into the back of the Fiat Professional Talento. Challenge three was a test of versatility to confirm how each team would fare at the other’s sport. Team Football had to individually catch three high kicks with a rugby ball, as if they were claiming an up and under, while Team Rugby had to control a football kicked high into the air with their feet. Points were awarded for technique and flair. Team Football emerged victorious following some textbook high ball catches from Danny Mills, meaning they claimed the overall challenge victory and bragging rights over their rugby counterparts. Watch the video to view the whole challenge! With the new Fullback, Fiat Professional has entered the buoyant medium-duty pick up segment which accounts for 650,000 vehicles a year in the EMEA (Europe, Middle East and Africa) region. Engineered to meet the broad needs of business users – both professional and recreational – the new Fiat Professional Fullback offers high levels of flexibility and dependability. The front of the Fullback adopts the upmarket appearance of a sports SUV while distinctive swage lines along the flanks tie the front of the pick-up to the rear, integrating the load bed as part of the vehicle's overall design. Prices start at £21,095 (excluding VAT, VED, delivery and plates) for the 2.4 Diesel 150HP Double Cab 6 Spd Manual SX (MY16). The all-new Fiat Fullback is available from all Donnelly Fiat and Fiat Professional dealerships located in Newtownabbey, Dungannon, Eglinton and Enniskillen.